Like him or loathe him, markets are having to listen to President Trump and keep an eye on his Twitter account for good measure (even if his heavy use of the service has done precious little to help that particular company’s wobbly profit and loss account or share price). It is hard to believe that the mid-term elections are already behind us and the Republican leader and his would-be Democrat challengers are now already starting to think about the 2020 Presidential Election. The race starts now. Even if the picture regarding the Democratic candidate is very unclear at this early stage, it seems likely that middle-ground options like former Vice-President Joe Biden would be a poor choice when it comes to fighting Trump. 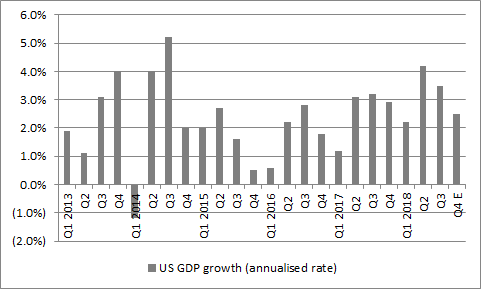 America’s economy is going gangbusters, although whether this is a one-off owing to the sugar-rush of the tax cuts introduced in late 2017 remains to be seen, as does whether the US can keep growing so fast when its trading partners are not. And the issue of trade remains acute as the White House keeps up the pressure on China, not to mention the EU. History suggests no-one really wins a trade war, but the President seems determined to prove that history is bunk. This may be no bad thing, as history suggests US stocks look expensive, which is not ideal when interest rates are going up (albeit slowly) and Quantitative Easing is being withdrawn. However, corporate profits are surging and analysts’ estimates are still going up so finding a trigger for the long-awaited major correction in US stocks remains as difficult as ever, even if Federal Reserve policy error is always a possibility – at least if history is any guide. Whether you like him or not, President Trump is proving to be that most unusual type of politician – the one who sticks to his campaign promises, on issues such as trade, tax, employment and foreign affairs. He is tackling issues such as North Korea, Chinese intellectual property theft (under the Section 301 of the 1974 Trade Act), US jobs, Iran and in many cases making more progress than many expected, especially when it comes to the talks with Kim Jong-Un and Pyongyang and the American economy. His blustering style, all outlined in his book The Art of the Deal can therefore be said to be getting results, even if the results, and the manner in which they are achieved, are not to everyone’s taste. The spiralling budget deficit offends the Republican Party, his trade and tariff tactics are upsetting everyone from Toronto to Tokyo and Mr Trump clearly got up everyone’s noses at the summer’s G7 meeting in Ottowa, Canada. The President is unlikely to care about any of that. But his sliding opinion polls at home do rankle, given his assertion on Twitter that the Mueller investigation (or the ‘Rigged Russian Witch Hunt’, as Trump called it) was knocking 25 points off his rating. And the President clearly cares about his ratings, especially after November’s mid-term elections left the Republicans with control of the Senate but handed the lower House of Representatives to the Democrats. Trump will already be thinking about 2020’s Presidential election, too. With the economy still strong and the identity of his ultimate Democratic challenger is far from clear, he will doubtless feel that he can win a second term, although Robert Mueller’s ongoing investigation into Russian influence on the 2016 Trump campaign means that the threat of impeachment lurks, no matter how unlikely it seems for now. As the race to the White House begins again, investors will look to see whether one historical quirk holds true: the third year of a Presidential term is, on average, the best one for the US stock market performance and Barack Obama’s second stint is the only one to have yielded a negative return for investors in US stocks since 1945. With the US economy seemingly firing on all cylinders many investors will fancy the Trump administration’s chances of embellishing that particular statistic. Optimism abounds. The Conference Board consumer confidence indicator reads 135.7, its second highest mark since March 1998, while the ISM Purchasing Managers’ Index (PMI) for manufacturing stands at 57.7, only marginally below the 61.4 reading seen in August that represented the highest levels of industrial confidence since May 2004. Perversely, this is perhaps where investors may need to tread a bit more carefully. The ISM has given a few false signals but the Conference Board consumer confidence indicator has not. 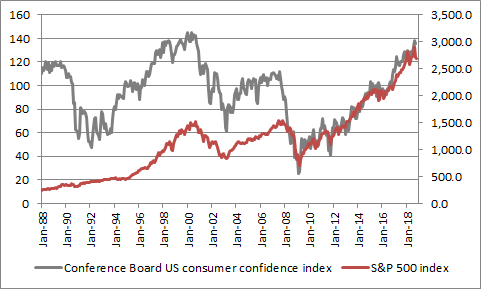 Consumer confidence has reached similarly lofty levels three times in the last 20 years – and on each occasion things have only got worse from here, including for the US stock market. It is always possible to debate cause and effect here and it still remains to be seen whether the President’s tariff plans and “Make America Great Again” policy has all of the intended consequences, and no unintended ones, for three reasons. First, history suggests that no-one really wins a trade war. The introduction of the Smooth-Hawley Act in the USA in 1930 is a good example of this. America’s move toward protectionism prompted retaliatory measures from Europe and elsewhere. Global trade suffered as a result and a difficult economic (and financial market) environment was made substantially worse than it may have been otherwise. Second, tariffs and protectionism are inherently inflationary as the result is higher prices for consumers. Looking at this through the narrow prism of portfolios, this must be considered at a time when many advisers and clients investors still fear a downturn, even deflation, or are at least seeking dependable income, and have sizeable allocations to bond funds and equity income funds that are packed with so-called ‘bond proxies’ as a result. If inflation really does take hold, they are the sort of asset classes that could do relatively well (or at least less badly), should history prove to be anything like a reliable guide. Finally, President Trump’s attempts to put ‘America first,’ run a trade surplus and reverse 47 years of economic history could have some very serious side effects, at least if the so-called ‘Triffin Dilemma’ has any say in it. This is because the Trump plan would drain the world of the very dollar liquidity upon which it is reliant. It is already possible to see the effects of even a minor decrease in dollar liquidity (due to rising interest rates and a gentle withdrawal of Quantitative Easing in the USA), given the carnage in emerging financial markets and currencies. And that is happening after only a mild increase in the dollar’s value and slowdown in supply growth. 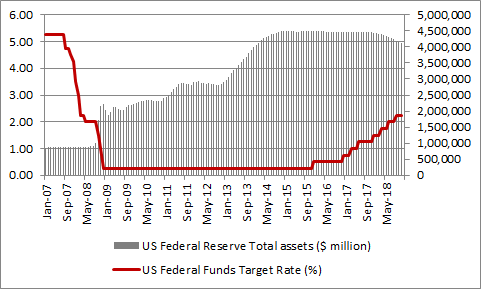 This all leaves the US Federal Reserve with a tricky balancing act. Under chair Jay Powell, the US central bank seems determined to try and normalise monetary policy, to nip any potential asset bubbles in the bud (even if some would say it is already too late on that front), cap inflation and get ready for the next, inevitable downturn. The central bank is raising interest rates and withdrawing its Quantitative Easing (QE) stimulus at the rate of up to $50 billion a month. Source: Refinitiv data, based on S&P 500 index. 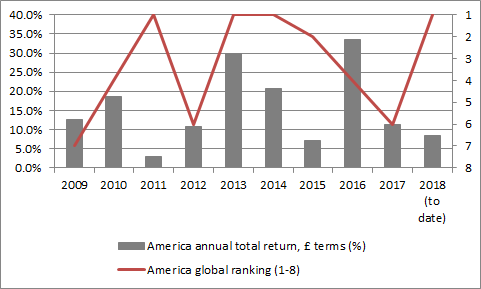 Total returns in sterling terms, 1 January to 29 November 2018. The question now is whether strong momentum in the economy and corporate earnings can offset the impact of tighter monetary policies and worries about trade. To cut through the noise, investors with exposure to US stocks can look at three indicators which have a decent record as indicators for wider market trends – although we must always acknowledge that the past is no guarantee for the future. The old theory is that if the economy is doing well, the transport stocks will do well, as goods are being sold and therefore new supplies must be shipped. 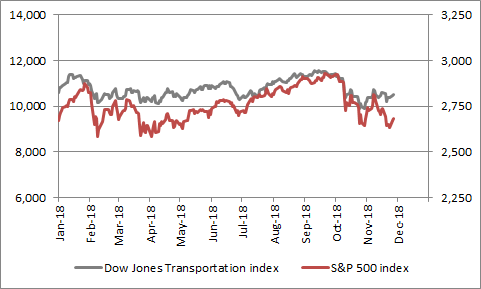 Bulls will be concerned to see that the Dow Jones Transportation index trading some 9% below its year high although the benchmark looks to be stabilising at 2018 draws to a close. 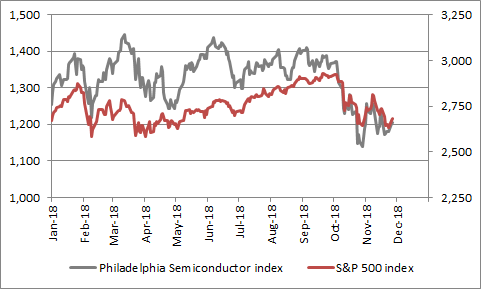 The Philadelphia Semiconductor index, or SOX, contains 30 companies who are involved in the design, manufacture and sale of silicon chips and it is therefore a very useful guide for investors on two counts. First, these integrated circuits are everywhere, from smart phones to computers to cars to robots, so they offer a great insight into end demand across a huge range of industries and therefore the global economy. Second, chip-makers’ and chip-equipment makers’ shares are generally seen as momentum plays, where earnings growth is highly prized and valuation less of a consideration. As such they can be a good guide to broader market appetite for risk. The SOX is down by 17% this year and it peaked in March, so this does not look so great. This poor showing may reflect lingering concerns over trade disputes with China in particular but bulls of US stocks will want to see the chip stocks running hot again. 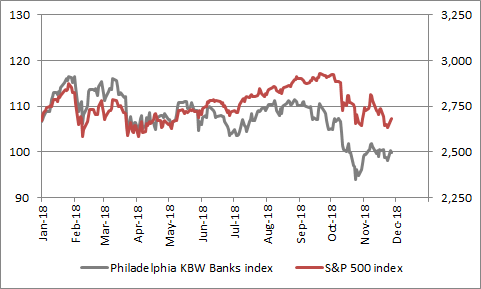 Both the economy and the financial markets do need healthy banks if they are to thrive so a relatively feeble performance from the Philadelphia Banks index is a concern. Like the SOX, it peaked in March and has dropped by more than 10% in 2018. Any further sustained weakness could warn of economic and market troubles ahead since the Banks sector lost momentum in early 2007, well before the peak in the S&P 500 and the Great Financial Crisis.